What Went Wrong with the Buildings in Haiti? It was the poorly constructed, mostly concrete buildings that killed most of the victims of the earthquake in Haiti. Like a lot of people, I’ve been thinking about the devastation from the earthquake in Haiti, seeing images of collapsed buildings and dead people on the news and in the newspapers. I wonder why less than a hundred people in the Bay Area died in the Loma Prieta earthquake in 1989, and perhaps as many as 200,000 have died from the earthquake last month in Haiti. The Transamerica Building in downtown San Francisco swayed about one foot at the top during the Loma Prieta earthquake, but the building was not damaged. We’ve all seen pictures of what happened to Haiti’s Presidential Palace in Port au Prince. I did an Internet search and discovered the Pacific Earthquake Engineering Research Center (PEER) at Cal Berkeley. PEER is an interdisciplinary organization that studies the effect of earthquakes on structures and how to build safe structures in earthquake zones. 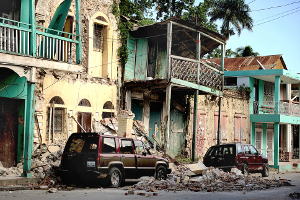 PEER asked a structural engineer, Eduardo Fierro, P.E., of Bfp Engineers in Berkeley, to travel to Haiti and make a preliminary report on the damage there. This is Fierro’s two-hour presentation at Cal Berkeley from the PEER Web site. Fierro knows his stuff when it comes to structures, but in the video he shows that, for him, it is a matter of the heart as well as the head. I am not a structural engineer, but I remember enough from my mechanical engineering courses to understand the basics of building in an earthquake zone, and the PEER video was like a two-hour refresher course. I know that in order for a concrete building to handle its own weight (compression), as well as lateral forces (tension), the concrete must be reinforced with steel bars. The steel can handle the tension while the concrete can handle the compression. I do know that it was the poorly constructed, mostly concrete buildings that killed most of the victims of the earthquake in Haiti. Buildings slid off their foundations if they were not bolted to the foundation, floors collapsed because of shear stress and the lack of sheer walls, and poorly reinforced concrete pillars holding up buildings collapsed. There are no enforced building codes in Haiti. The concrete quality used in buildings in Haiti is poor, and the installation of concrete is done poorly. The concrete is brittle, and the steel bars used to reinforce it are too thin; there are not enough of them; and when a concrete pier comes together with the concrete floor of a second story, for example, the vertical reinforcing bars in the pillars are often not connected to the horizontal bars in the floor, meaning that the building has no integrity. A few buildings near the epicenter of the earthquake held up well, but this is not because of the quality of the construction. The intact buildings are built on solid rock, so that the rock absorbed the shock of the quake, so the building didn’t have to. Within loose soil, an earthquake causes a phenomenon called liquefaction. The soil becomes like liquid, and passes most of the force of the earthquake into the building above the soil. Perhaps the saddest thing that Fierro reported was the fact that, already, people are picking up the pieces of broken buildings, and building structures in the same old way. It’s a poor country with a history of conflict and oppression. It may be the best the Haitian people can do, without the help of wealthier nations. In my research on how the buildings performed –or didn’t–in the earthquake in Haiti, I have learned a lot about vernacular building in Haiti, and in other earthquake-stricken countries, who were also romanced by the notion that concrete was a smart way to build, in spite of its thermal discomfort, expense, high embodied energy, and poor aesthetics. http://conservationtech.com/ , and http://haiti-patrimoine.org/ . Prev Reporter's Notes: Is The Drought Over? Next Is The Drought Over?